Late 1986: King Tonga teamed with The Tonga Kid as a babyface tag team in the World Wrestling Federation. September 13, 1986 – Superstars: The Islanders (King Tonga & Tonga Kid) defeated The Moondogs (Moondog Rex & Moondog Spike). September 21, 1986 – Wrestling Challenge: The Hart Foundation (Bret Hart & Jim Neidhart) vs. The Islanders (King Tonga & Tonga Kid) ended in a double disqualification. September 22, 1986 – MSG Network: The Islanders (King Tonga & Tonga Kid) defeated The Moondogs (Moondog Rex & Moondog Spike). October 11, 1986 – Superstars: Pedro Morales & The Islanders (King Tonga & Tonga Kid) defeated Ken Glover & The Hart Foundation (Bret Hart & Jim Neidhart). October 25, 1986 – Superstars: The Islanders (Haku & Tama) defeated Barry O & Steve Lombardi. November 2, 1986 – Wrestling Challenge: The Islanders (Haku & Tama) defeated Iron Mike Sharpe & Terry Gibbs. November 15, 1986 – Superstars: The Islanders (Haku & Tama) defeated Barry O & The Gladiator. November 30, 1986 – Wrestling Challenge: Dino Bravo & The Dream Team (Brutus Beefcake & Greg Valentine) defeated Sivi Afi & The Islanders (Haku & Tama). December 20, 1986 – Superstars: The Islanders (Haku & Tama) defeated Bob Orton & The Magnificent Muraco by disqualification. December 28, 1986 – Wrestling Challenge: Butch Reed, Nikolai Volkoff & The Iron Sheik defeated The Islanders (Haku & Tama) & Jose Luis Rivera. February 1, 1987 – Wrestling Challenge: Nikolai Volkoff & The Iron Sheik defeated The Islanders (Haku & Tama). 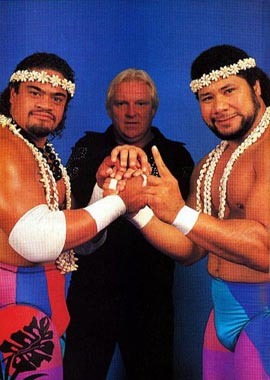 February 1987: King Tonga and The Tonga Kid both turned heel and renamed to “Haku” and “Tama” – known as the Islanders. The Islanders turned heel and were then managed by the infamous Bobby “The Brain” Heenan – members of the Heenan Family. February 21, 1987 – Superstars: The Hart Foundation (Bret Hart & Jim Neidhart) defeated The Islanders (Haku & Tama) to retain the world tag team titles. February 23, 1987 – MSG Network: Demolition (Ax & Smash) defeated The Islanders (Haku & Tama). April 5, 1987 – Wrestling Challenge: The Islanders (Haku & Tama) defeated Al Navarro & Iron Mike Sharpe. April 25, 1987 – Superstars: Butch Reed, Nikolai Volkoff & The Iron Sheik defeated Sivi Afi & The Islanders (Haku & Tama). April 26, 1987 – Wrestling Challenge: The Islanders (Haku & Tama) vs. The Rougeau Brothers (Jacques Rougeau & Raymond Rougeau) ended in a double count-out. May 16, 1987 – Superstars: Demolition (Ax & Smash) defeated The Islanders (Haku & Tama). May 17, 1987 – Wrestling Challenge: The Killer Bees (B. Brian Blair & Jim Brunzell) defeated The Islanders (Haku & Tama) by disqualification. May 30, 1987 – Superstars: The Islanders (Haku & Tama) defeated The Can-Am Connection (Rick Martel & Tom Zenk) by count-out. June 13, 1987 – Superstars: The Islanders (Haku & Tama) defeated Eric Cooper & SD Jones. July 4, 1987 – Superstars: The Islanders (Haku & Tama) defeated Frankie DeFalco & SD Jones. July 12, 1987 – Wrestling Challenge: The Islanders (Haku & Tama) defeated Jerry Allen & Mario Mancini. August 9, 1987 – Wrestling Challenge: The Islanders (Haku & Tama) defeated Omar Atlas & Rick Hunter. August 22, 1987 – Superstars: The Islanders (Haku & Tama) defeated Jerry Allen & Mike Richards. September 6, 1987 – Wrestling Challenge: The Islanders (Haku & Tama) defeated Jesse Cortez & Steve Gatorwolf. September 26, 1987 – Superstars: The Islanders (Haku & Tama) defeated Brady Boone & Jim Evans. October 1987: The Islanders began feuding with Tag Team champions Strike Force but couldn’t win the titles after many attempts. October 11, 1987 – Wrestling Challenge: The Islanders (Haku & Tama) defeated Mario Mancini & Mike Richards. October 16, 1987 – MSG Network: Strike Force (Rick Martel & Tito Santana) defeated The Islanders (Haku & Tama) in a best 2 out of 3 falls match. October 17, 1987 – Superstars: The Islanders (Haku & Tama) defeated Jim Evans & Tony Parks. November 21, 1987 – Superstars: The Islanders (Haku & Tama) defeated Bill Wood & Leo Morgan. December 8, 1987: The Islanders vs. The British Bulldogs ended in a no contest when The Islanders kidnapped Matilda! ~~~WWF President Jack Tunney would later announce that the Islanders were indefinitely suspended until Matilda was found! December 12, 1987 – Superstars: The Islanders (Haku & Tama) defeated Jerry Allen & Jim Parks. December 26, 1987 – Superstars: The British Bulldogs (Davey Boy Smith & The Dynamite Kid) vs. The Islanders (Haku & Tama) ended in a no contest. December 26, 1987 – MSG Network: The Islanders (Haku & Tama) defeated The Killer Bees (B. Brian Blair & Jim Brunzell). January 9, 1988 – Superstars: The Islanders (Haku & Tama) defeated Jerry Grey & Lanny Poffo. January 24, 1988 – Wrestling Challenge: The Islanders (Haku & Tama) defeated Brady Boone & Eric Cooper. January 24, 1988 – Royal Rumble: The Islanders defeated The Young Stallions (Paul Roma and Jim Powers) in a best 2 out of 3 falls match. January 25, 1988 – MSG Network: The Islanders defeated The British Bulldogs by disqualification when the bulldogs used a leash as a weapon. January 27, 1988: The British Bulldogs defeated The Islanders and continued to do so on House Shows for a month. February 14, 1988 – Wrestling Challenge: The Islanders (Haku & Tama) defeat Eric Cooper & Lanny Poffo. February 20, 1988 – Superstars: The Islanders (Haku & Tama) defeated Omar Atlas & Rick Hunter. March 7, 1988 – SNME: The Islanders (Haku and Tama) defeated The Killer Bees (Brian Blair and Jim Brunzell). March 20, 1988 – Wrestling Challenge: The Islanders (Haku & Tama) defeated David Stoudemire & Mark Young. March 27, 1988 – WrestleMania 4: The Islanders and Bobby Heenan defeated The British Bulldogs and Koko B. Ware w/Matilda. April 9, 1988 – Superstars: The Islanders (Haku & Tama) defeated Mark Young & Tony Parks. April 21, 1988: The Islanders and High Chief Afi w/Bobby Heenan defeated Outback Jack and Brady Boone, and Steve Blackman. ~~~Bobby Heenan introduced Afi as a new member of the Islanders, but it was his only appearance with the group. April 1988: Tama left the World Wrestling Federation and Haku had a singles run going under the name “King Haku”. May 7, 1988 – Superstars: The Islanders (Haku, High Chief Afi & Tama) defeated Brady Boone, Outback Jack & Steve Blackman. May 27, 1988 – MSG Network: Bobby Heenan & The Islanders (Haku & Tama) defeated Koko B. Ware & The British Bulldogs (Davey Boy Smith & The Dynamite Kid).